Buffalo Ridge is a nice set of short summit hikes for beginners and a longer loop hike. This brief introduction eventually focuses on the hike up to the western prominence of the ridge. 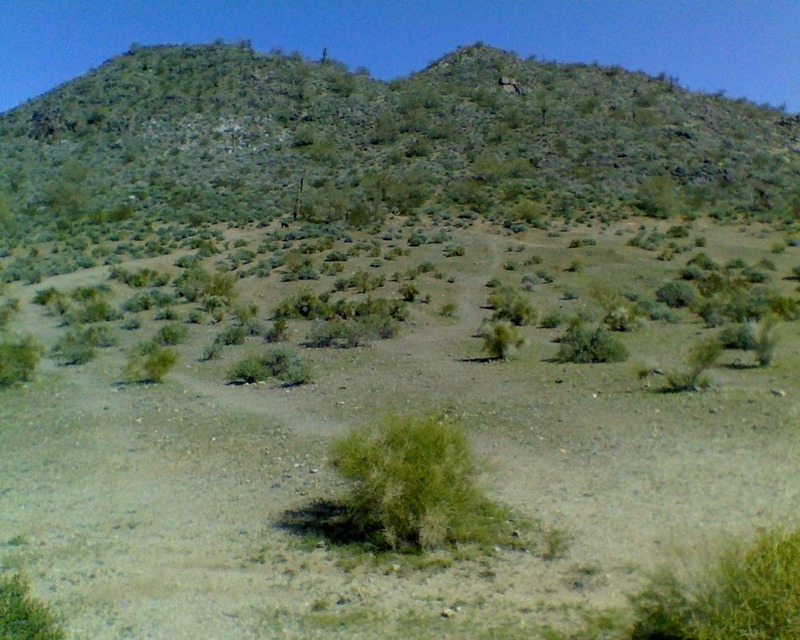 Located just a few blocks west of Cave Creek Road and abutting AZ101, the activity area is easy to get to and offers a number of nearby post-hike refreshment options (particularly on the southern side of AZ101 at the Cave Creek exit. 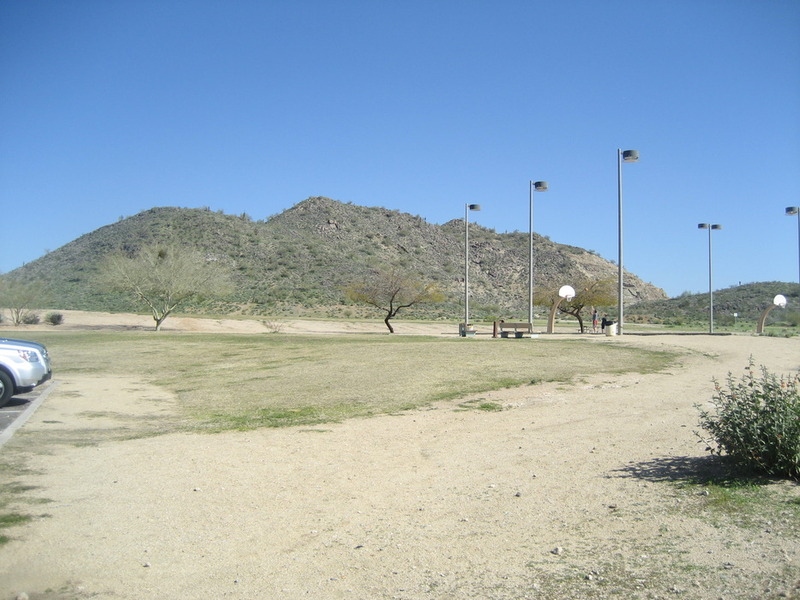 Buffalo Ridge Park occupies a portion of the southeastern quadrant of the activity area and provides restrooms, at least one water fountain, trash receptacles, a playground, lighted basketball courts, lighted softball diamonds and a fairly well-regarded disc golf course. The entire area north of the park is also popular for mountain biking and jogging. This is not a maintained trail. Because the Buffalo Ridge trails are fairly undeveloped (compared to, for instance Lookout Mountain three miles south on 16th Street, the western edge of the activity area), the trailhead can be considered to be the parking lot of Buffalo Ridge Park (roughly 33.659683, -112.045679). From this location, you can see the major prominences to the north and minor prominences sweeping clockwise from the north to the east. Walk north from the parking lot towards the ridge. You pass by the basketball courts (on your right) and a softball/baseball diamond and "soccer field" on your left. Head towards the "incline insertion point" (directly below the saddle point between the western and central prominences) and just to the east of Hole 12 of the disc golf course. The initial part of the trail is simply a natural drainage channel, so you need to be a little alert and stay on the "path" that leads upward as far as you can see. About 250' (linear) from the insertion point, the path becomes easier to see and it's a nice jaunt (past a nice sitting rock and a saguaro skeleton) to the saddle point between the western and central prominences and the location of "sinkhole." From the sinkhole, it's an easy walk west to the crest of the prominence. Depending on how much the bushes and other plants may have grown, the path may be a bit difficult to see. If that's the case, it's helpful to start up the towards the central prominence (to the east a bit) to get some height so you can see the path from an elevated position. 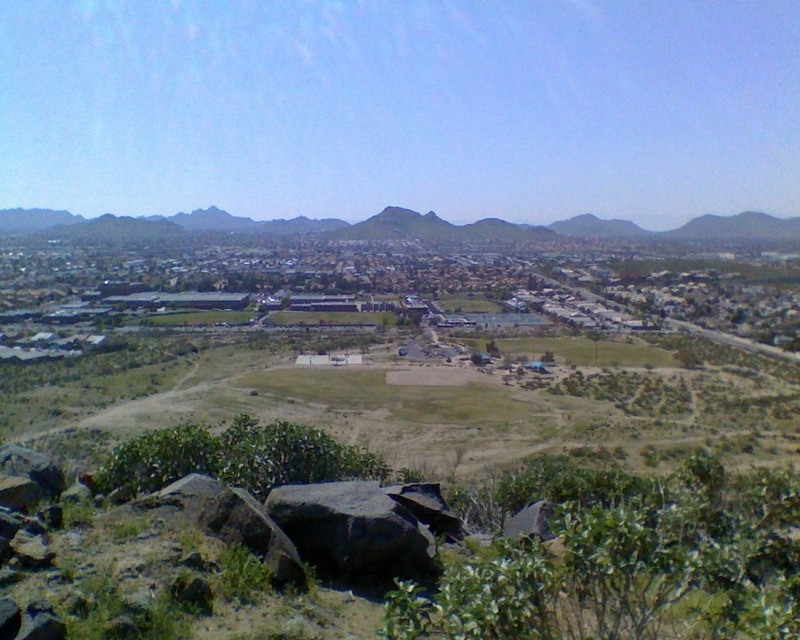 From this location, you can see Lookout Mountain two miles to the south and the Beardsley Boulders to the north. Westbound AZ101: Off at Cave Creek Road exit. Left turn (south) onto Cave Creek Road to Union Hills Drive. Right turn (west) onto Union Hills Drive to 16th Place. Right turn (north) onto 16th Place to Wescott Drive. Right turn (east) onto Wescott Drive and left (north) into parking lot of Buffalo Ridge Park. Eastbound AZ101: Off at 7th Street exit which merges into Beardsley Road (eastbound). Cross 7th Street and 12 Street to 16th Place. Left turn (south) onto 16th Place to Wescott Drive. Left turn (east) onto Wescott Drive and left (north) into parking lot of Buffalo Ridge Park.